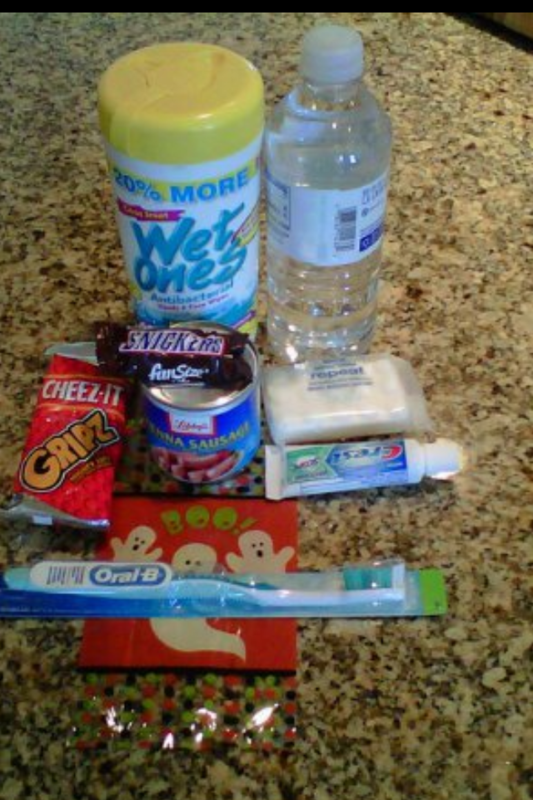 Mama’s Hobo Handouts «Miss um... Erica?!?! Miss um… Erica?!?! I’ve been thinking this morning over coffee, and I think I may have come up with an idea that’s going to make me & Mama rich. I haven’t exactly worked out all of the kinks in the plan yet, but the wheels are turning and I think I may have stumbled onto something brilliant. Allow me to think out loud here. When I was away at school my last two years of high school and the four years following for college, my mom used to send me makeup and money in care packages. 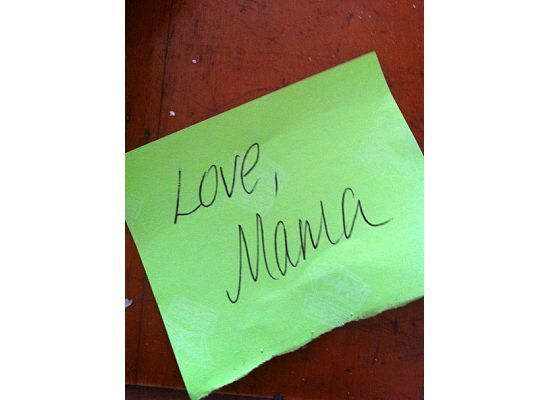 If she had time, she’d even put a sticky note in there saying, “Love, Mama.” Never home-baked cookies or long drawn out letters or anything because Mama was busy. She looked out for her girls though and would sometimes cut articles out of the newspaper warning us of life’s dangers with headlines like, “Why Women Should Always Carry Mace,” or “Pitt Bull Mames and Scars Well-meaning Dog Lover at Festival,” and stuck to the article would be a sticky note that said, “SEE! That’s why you never go around petting OTHER PEOPLE’S dogs!!! Love, Mama.” One time when I was “studying” in Spain for a summer, I called Mama collect and told her I needed her to send me some deodorant STAT. I was running out and decided not to purchase a foreign tube because the same-looking packages must contain different chemical compositions since too many people had offended me with their B.O. She apparently understood the gravity of the situation and high tailed it to K&B and subsequently the post office. When my package arrived a week later, I excitedly opened it in front of my friends and the gravity hung my head in shame when my friends saw the contents. Not one but TWO sticks of deodorant and…. well, no “and.” That was it. No cookies and not even a note this time, but I knew she loved me anyway despite the barren box. My mama is one of those people who has a very hard time saying no. She also has a very big heart, so the combination doesn’t always produce desirable consequences. Take the homeless people, street corner hobos and the panhandlers from The WalMarts. We really have no way of distinguishing who is truly in need of a hand up and who is simply a con artist and when you walk away. Whether you have donated or not, you leave feeling a little disheartened. Were you duped and therefore perpetuated a practice that the businesses in the area frown upon because it drives away customers? Did you say no and may have just left a needy person hungry? Did you refuse to give money and give someone a box of pop tarts you happened to have with you only to be scolded by your lack of generosity from the guy requesting? I’ve done all three. Mama’s done all three. Mama went so far in a restaurant one time to give a guy $20 for the part he needed to fix his car in the parking lot only to have the staff approach her later and tell her not to do that again since the same guy has been run out of the restaurant many times before always leaving with a wad of cash from his con. “But he looked so nice and honest. He was all nicely dressed and well spoken!,” declared Mama. “That’s why it works for him,” declared the manager. Maybe she feels bad when she sees someone drooling because their mama didn’t catch the Seal A Meal correlation early enough. One of my friends posted a picture a while back of her little “Hobo Bags – The Halloween Edition.” This girl is the cutest, peppiest thing to walk the planet. She has more energy that the Energizer Bunny and she never slows down. She always manages to take care of the kids, husband, house, business AND herself and she looks great doing it too! She sat down with the kids and made Hobo Bags for the homeless filled with little travel size wet wipes, toiletries, snacks and water and I thought it was a FANTASTIC idea! Win-win! She kept the kids busy and also taught them how to be charitable at the same time while providing something that’s useful and I’m sure appreciated by those who receive the little bundles from the back of her car. If she can figure out how to monogram a Ziploc bag, I wouldn’t put it past her to do it too. Here’s where my mind is going now though.I know a whole helluvalotta people who simply don’t have the time or don’t THINK they have the time or don’t want to SPEND the time doing this. BING! Why couldn’t Mama and I mass produce these little bags of joy and then sell them at a small mark-up to the LAZY charitable people?? I think there’s a whole market there that hasn’t been tapped yet. I mean, we’ve all learned to give back through time, effort and money aimed at charitable causes, but we’re still stuck wincing and walking around people sometimes at The WalMarts and city street corners. What if we ALL had Hobo Bags in our cars – even the Lazy Givers? Mama and I could make an assembly line at the kitchen table with Kendall Jackson and churn out a bunch of these puppies that the LGs (Not lesbians and gays although I’m sure there are plenty of lazy giving lesbians and gays too because I know some) could then PURCHASE from US to keep in their cars!! The LGs would feel good about handing out their bags, the truly needy people would be appreciative, the con artists would be PISSED, and Mama and I would make a nice little profit. Everybody wins!!! And then we could put a nice little sticky note in there that said something like, “Love, Mama ♥” People would get all warm & fuzzy, and Mama could make up for all the “practical” care packages she sent me and my sisters in college that I’m sure she feels just terrible about, bless her heart. Y’all get ready because I think this is gonna happen. I’m going to get my people on it (as soon as I get “people”) so be looking for them on the shelves at The WalMarts. I think I’ll call them Mama’s Hobo Handouts!